What is Jane Austen's Best Novel? "It is a truth universally acknowledged..." that Jane Austen's best novel is Pride and Prejudice. Okay - so it's probably not universally acknowledged, but the opinion is widespread. Now that an incomplete, 68 page, handwritten manuscript of Austen's unfinished novel The Watsons, has sold to the Bodleian Library for almost £1 million, it seems timely to examine the works of the original and enduringly popular author of Rom Com fiction. So we'd like to know, which Austen novel is your favourite? My vote definitely goes to Pride and Prejudice. In 2003 Pride and Prejudice came second in "The Big Read", a BBC competition to find Britain's best loved book (for those who are interested it was beaten by J. R. R. Tolkien's The Lord of the Rings). This result was replicated in 2004 in Australia's "My Favourite Book" competition. So it would seem that an awful lot of people agree with me. What's not to love about the romantic trials and tribulations of the Bennett sisters and memorable characters like the strident Mrs. Bennett and the obsequious Mr. Collins? Perhaps you prefer following the fortunes of the Elinor and Marianne Dashwood in Sense and Sensibility (Austen's first published novel), or the lovable but infuriating Emma Woodhouse – "handsome, clever and rich". Maybe the gothic novel parody, Northanger Abbey, is more your style. Personally I've never been able to come to terms with Mansfield Park and its annoying heroine, Fanny Price. My own second favourite is Persuasion, the story of a second chance at love for Anne Elliot and Captain Wentworth. So, over to you. What is Jane Austen's best novel? My favourite is in fact Pride and Prejudice. Certainly the Colin Firth production has given a strong breath of life to the text and thankfully to most chicks - LAKE SCENE! I still get texts and calls from friends when it's coming up on tv. So brilliantly crafted. Intricately woven. Engaging and entertaining. I went to Bath and sat in her room down the road from the Museum (no Mr Darcy there) and it was a solicitor's office. 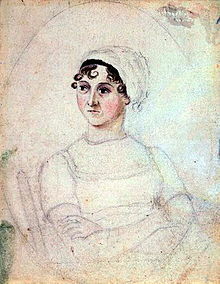 The lady there was oblivious to the history - Austen's shape occupying the window years before, as she was a social observer conjuring up her stories - a writer of her time for all time - she is universal! Read it and laugh, cry and crave Darcy - there are familiar characters you will recognise in your life now... and it's a classic! While Pride and Prejudice is my favourite I'm relieved to see a vote for Emma. Let's face it - all the novels demonstrate her characteristic wit, humour and social observation, and are beautifully written. I'm also going to give a vote to Pride and Prejudice, but sadly that is because so far it is the only one I've read. I remember picking it up in a school library when I was visiting a friend overseas. I just couldn't put it down and I read it for as long as I could there in that library, I bought the book the second I got home to Australia. I'm also glad to see a mention for Colin Firth in the comments! Matthew Macfadyen (from the film) just doesn't have the same effect at Colin Firth does. I think that the miniseries is a far better portrayal of the book, my housemate used to watch it all the time. She'd just wake up on the weekend and decide to watch the Pride and Prejudice miniseries. As you say, Pride and Prejudice is awfully hard to beat, especially since it has by far the best BBC adaptation. I think Elizabeth appeals to a lot of women as a heroine, since she's smart and sassy and knows her own mind. That said, I do love Northanger Abbey, very tongue in cheek, and Sense and Sensibility still has to get a vote from me. I like the Mansfield Park adaptation with Frances O'Connor more than the novel - it's has a bit of a naughty slant given to it by Patricia Rozema. Still have trouble with the whole 'kissing cousins' thing though, even though I know it was normal then! Persuasion - Anne Elliott is one of Austen's strongest characters. A woman who acts in the way she sees is right, who understands regret, considers people for their own strengths not their social status, and knows what love is. Easily on par with Elizabeth Bennett. This is a total no-brainer - Pride and Prejudice all day long. It still amazes me how funny and relevant it is all these years later. I read Sense and Sensibility recently and it just didn't have that same magic for me. Persuasion. Getting a second chance at love with such a fine specimen as Captain Wentworth is mighty fine!